Following breakfast, we boarded the city bus that took us the perfect route through town for me to narrate the “Manta highlights” tour. We exited on the opposite end of town from where we got on, at the relatively new bus terminal. Here, I showed Gail just how far we’ve come from the terminal I bused to my first four years (although she never got to see the original to really appreciate the contrast). After a brief walk through of the mall area, we grabbed a taxi and headed to the nearby town of Montecristi. I love this town for several reasons, and have taken every previous visitor there to experience it (so view those blogs listed above for more details). We had a great English speaking guide for a visit to the museum area, and I learned even more about some of the specific history and culture of Ecuador (Montecristi is the birth and now burial place of one of Ecuador’s most famous and influential presidents). We then went down into the town for a light lunch at one of my favorite cafe restaurants, followed by a stroll through the shopping area for purchasing all the wonderful handmade, indigenous items available in Ecuador. Most specifically, Gail wanted to buy Milton an authentic Panama hat. The name Panama hat is a misnomer, because the original and authentic Panama hats (worn by the workers on the Panama Canal) are painstakingly handmade right here in Montecristi. We received a good orientation about the history and quality of this incredible wearable art, and Gail found the perfect hat for Milton’s head. Me with our museum guide. This was the hall built for rewriting Ecuador’s constitution in 2008. My favorite shop for purchasing handmade Ecuador items, and the guys who helped us choose the perfect hat. After shopping, we returned by taxi the short 15 minute ride to the Manta bus terminal, and then repeated our route on the city bus, stopping off at our new mall. I again wanted to show Gail the incredible progress that’s been made since I first arrived (although as I said, she didn’t get to come to Manta on her first trip). It was also the perfect place for her to buy some Ecuadorian chocolate and tea to take home. After our mall excursion, we grabbed a taxi and headed to our chosen dinner spot. Gail at first questioned why I was taking her to a hotel for dinner. That is, until she saw the view and tasted the food! The Poseidon Hotel is no doubt one of the best places for food in Manta, but the view is second to none! Although it was a bit cloudy, the view at the Poseidon Hotel infinity poolside restaurant cannot be beat! DAY 3: We slept until whenever and then had coffee up on my deck in my hammocks, spending a leisurely morning just chatting and visiting. Around noon, I called a taxi to take us in to Puerto Cayo for lunch at one of my favorite beach restaurants. Then we strolled back into the town and met up with my friend Teresa for introductions and a visit. We ended up walking around just a bit and then sitting in the covered sport court area of the town square. Positioned here, we got to observe the local “day-to-day life” activities all around us, and much to my delight, a never before seen vendor of “pan de yucca” (bread made from yucca/cassava root flour) came up with his little portable oven cart. This is always one of the bucket list food items I want people to try while they are here, and we got some giant, yummy rolls hot out of the oven (4 for $1). Gail took this photo of the sweet little lady who owns the restaurant. She was so surprised we wanted her picture. Eventually we walked the old route I used to travel back to my rental property, stopping briefly at Teresa’s front gate to drop her off. Her husband, Terry, arrived home from fishing just as we were saying goodbye, and Gail got to meet him as well. We then walked a short distance down to the home of my friend Sam, who lives just across from the house I first rented when I moved here. Gail had met Sam back then, and it was neat that they got to see each other again 5 years later. We took a walk through his gardens and up the hill behind his home, for easily one of the most breathtaking views in Puerto Cayo. Afterwards, we walked back down the road past various friends’ houses (including my second rental), and cut over from there onto the beach, where we strolled the rest of the way back to my house, catching a sunset view just as we arrived. DAY 4: We were again out fairly early to catch the bus a little after 8:00 a.m. 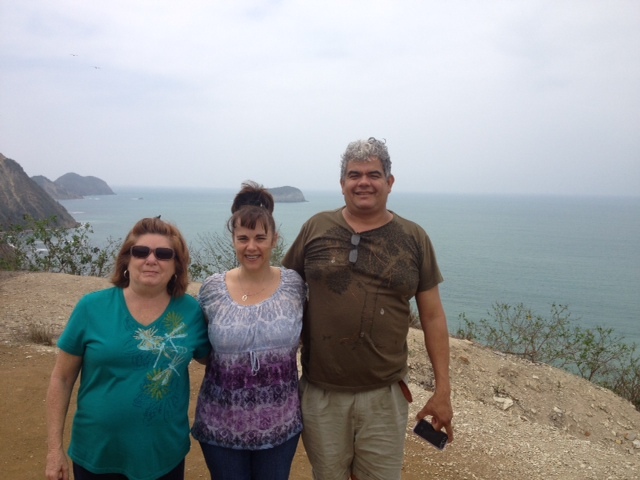 This time we were headed the opposite direction (south) to my favorite hang out town of Puerto Lopez. We had actually been taken there during Gail’s first visit, and I was surprised how much of it she remembered and was able to recognize the progress and improvements. We started at one end of the “malecon” (boardwalk/road along the beach) and walked all the way down to the pier on the opposite end, taking in the sites and food along the way. We started viewing the sites around the beautiful hostel at one end of the malecon called Mandala. 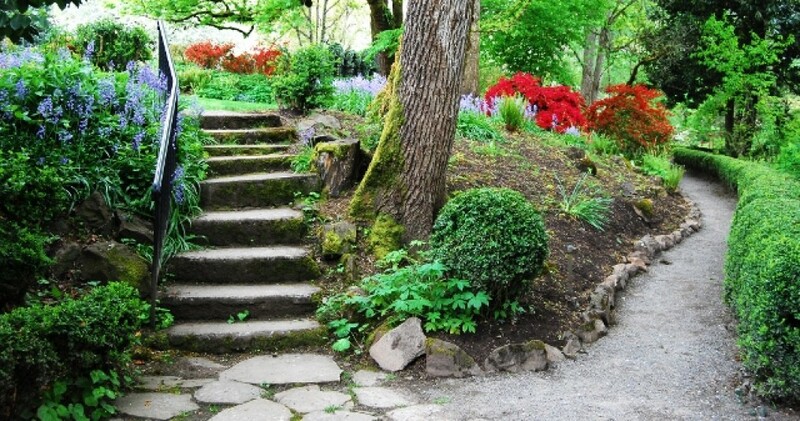 It has cabins nestled inside exquisite gardens, and is quite a peaceful spot. We then made our way to our next destination, breakfast at Hostel Victor Hugo. We wanted to eat light, so shared a traditional breakfast of scrambled egg and “bolon de queso,” which is a ball made out of mashed plantains, cheese and spices that is lightly fried. We then wandered our way along, stopping in my favorite local specialty items shops, and eventually got to the pier, where we enjoyed the peace of watching the boats and hearing the water – and not much else. Finally, we retraced our steps not quite halfway, to my favorite place for ceviche, Cabaña D’Chuky. The owner, Diego, and his wife make absolutely the best ceviche in Ecuador and arguably the whole world (Gail definitely agreed). Hostel Mándala, easily the most beautiful hostel in Puerto Lopez, with cabins nestled inside the extensive gardens. The best ceviche and patacones in the whole world! After a quick stop into town to pay my internet bill, we grabbed a taxi and were headed for our afternoon outing to Agua Blanca. This is another spot I love and like to take my guests for various reasons – it’s now a preserved national park and ongoing archeological excavation, but is also the home of an indigenous community of people that have lived here for centuries. After the museum, archeological and nature walk tour, we indulged in the natural mud skin treatment and therapeutic spring fed sulfur pond – it’s really quite a refreshing way to spend an afternoon! Afterwards, we met our taxi, who then brought us all the way back to my house. DAY 5: Today was another take it easy and visiting day. We tried to catch a bus, but he intentionally passed us right by. 😤 Oh well, I needed for Gail to be able to enjoy the obligatory back of the truck ride with my favorite taxi guy, Olimpio (it’s a guest right of passage). He came for us in a flash and a short 10 minute ride later, we were at the home of my good friends Bill & Elaine, and my goddog Tag. Gail had met them both her last time as well, because just a few weeks before I arrived they had rented the upstairs unit where I first rented downstairs. She knew immediately when she met them back then that she was leaving me in good hands. ☺️ It was great for her to get to see them again, as well as their completed (at least stage one) home, and meet Tag as well. So that sums up the first half of Gail’s visit. But stay tuned for my next post with lots more of our fun adventures to come! This entry was posted in Friends, Life in Ecuador. Bookmark the permalink. Mary is a great host and private tour guide. Along with all the sites you will get to see, she knows the history. She shares the love of her new country.